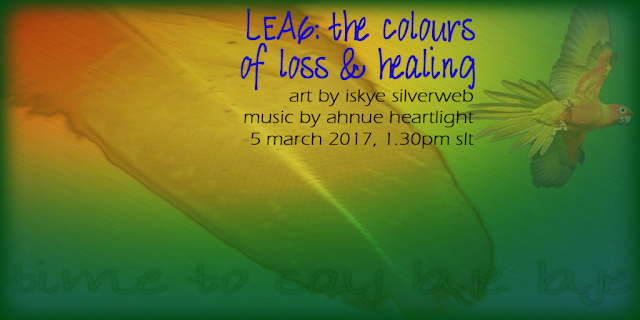 "The Colours of Loss & Healing" is an artistic collaboration by iSkye Silverweb and Ahnue Heartlight, where iSkye brings visual and poetic expression and Ahnue infuses sound and rhythm in a journey through the heart of loss into the healing knowledge that love continues on. With creative support by Dubhna Rhiadra. "Los colores de la pérdida y curación" es una colaboración artistica de iSkye Silverweb con Ahnue Heartlight, donde Skye presenta expresión visual y poética y Ahnue infunde sonido y ritmo en un viaje a través del hondo de la pérdida en el conocimiento curativo de que el amor continúa. Con el apoyo creativo de Dubhna Rhiadra. "I colori della perdita e la guarigione" è una collaborazione artistica di iSkye Silverweb con Anhue Heartlight, dove iSkye presenta un'espressione visiva e poetica, e Ahnue diffonde suono e ritmo in un viaggio attraverso la profondità della perdita e la comprensione curativa che l'amore continua. Supporto creativo di Dubhna Rhiadra. I would like to invite you to come to my art opening at the Linden Endowment for the Arts sim LEA6, named The Colours of Loss & Healing. If you have experienced a personal loss of someone, be it human or animal, a kindred soul, a much loved being - you are invited to come and participate in this journey I share through the loss of my own kindred soul of 21 years, Sunny, in a process that may likely echo your own. Being living beings of love and light we all experience these things, and come to a realisation that while we may have 'lost' those we love, we never really lose them. We always have their love.